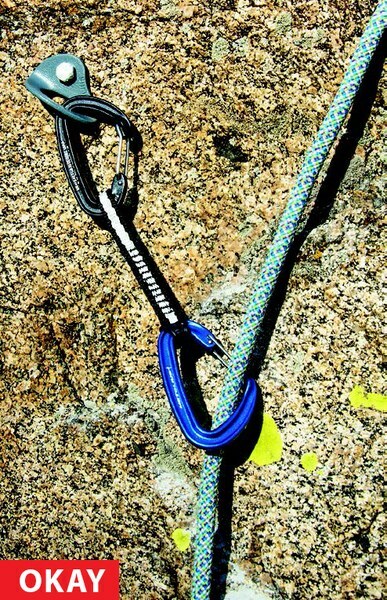 Topher Donahue's new book, "Rock Climbing Anchors, 2nd Ed. "—an update of Craig Luebben’s bestselling and beloved guide—provides comprehensive instruction for using anchors for virtually all climbing situations. 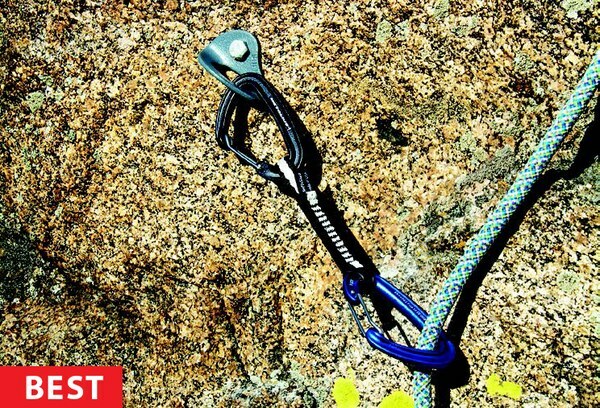 Here we've excerpted his piece on how to clip into bolts on sport-climbing routes. The weather is warming and many climbers are moving from gyms to outdoor rock. 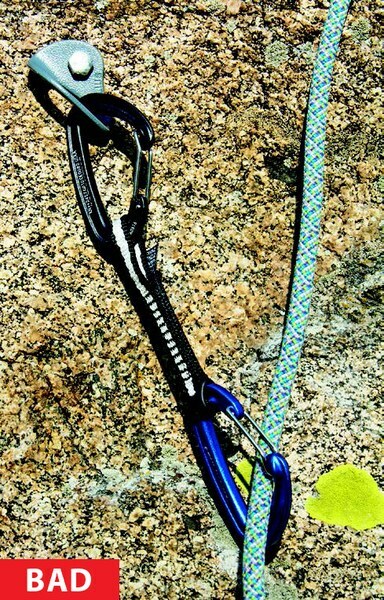 Most will be working on sport climbs with bolted anchors. 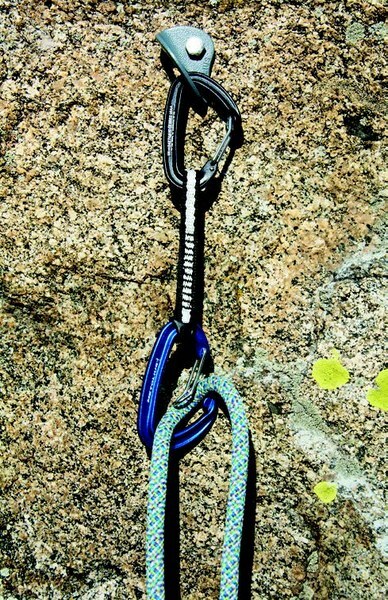 Here's a refresher on the correct way to clip into bolts excerpted from Chapter 6, "Sport Climbing and Bolted Anchors" in the new book, Rock Climbing Anchors, 2nd Ed., by Topher Donahue and Craig Luebben. Smith Rock, Oregon, lies in a beautiful gorge cut by the Crooked River. During the birth of sport climbing in America during the mid- to late 1980s, the highly featured volcanic rock was bolted to create a wealth of cutting-edge sport routes. Many of the country’s first 5.13 and 5.14 routes were climbed here, partly because Smith Rock was one of the first places where bolts proliferated. Not all the routes at Smith are hard. You can find 5.7s a few dozen feet from 5.14s, with an abundance of everything in between. Some of the early bolted routes are spicy—the bolts are spaced a little farther apart than on most modern sport routes. Generally, though, it’s like any sport climbing area: with preplaced bolts and little gear to carry, you can focus on the climbing. Because of the soft rock, some of the bolts are glue-ins, while others are standard mechanical bolts. You welcome the sunshine that warms the rock as you check your knot and harness, the belayer’s harness and belay device, and the stopper knot in the end of the rope. 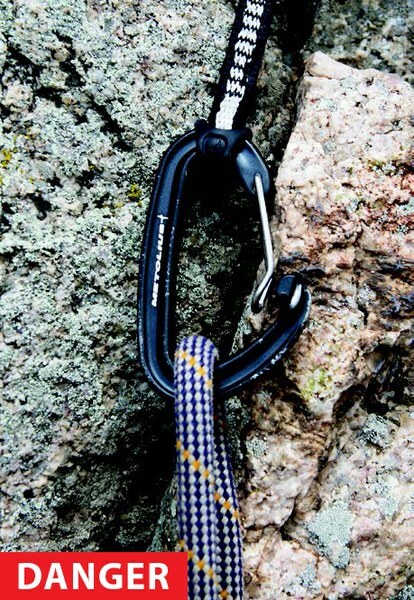 You make sure that you have enough quickdraws, all clipped in the same direction, with the rope carabiner (the one fixed in the quickdraw, often with a bent gate) hanging on the bottom. You also carry a couple slings and extra carabiners for attaching yourself to the top anchors, so you can rig the rope to lower at the top. Once you’re certain that everything is in line, you start up the pitch, enjoying the feel of the rock on your fingertips. set up bolted belay stations for multipitch routes. 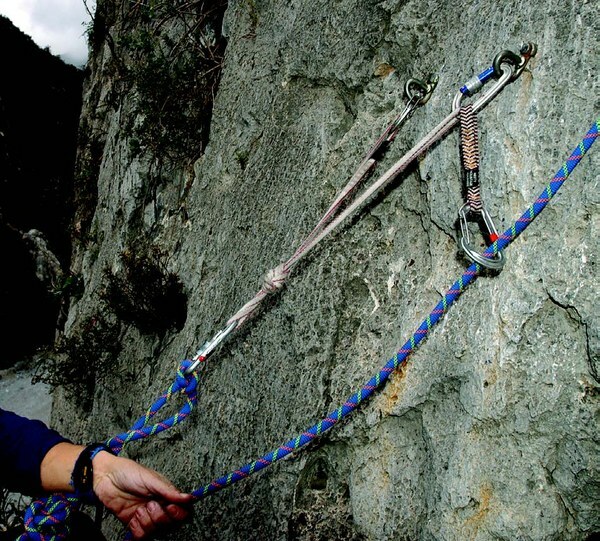 Ideally, the rope runs as straight as possible as you lead a route, because each bend in the rope adds drag. If the bolts lie in a fairly straight line, short quickdraws work fine. 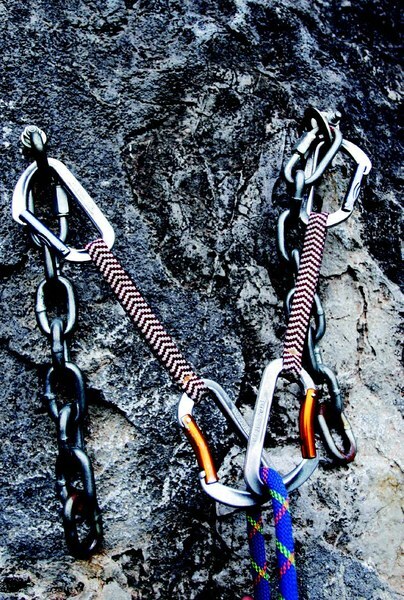 If the bolts wander or the route climbs overhanging rock, longer quickdraws help the rope run clean. 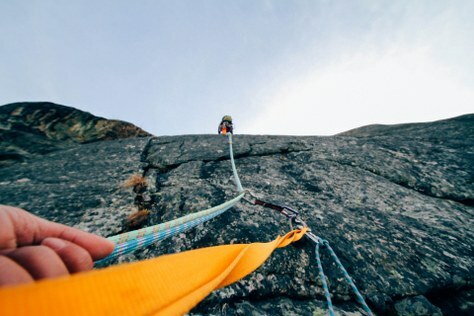 If a bolt is way off to the side or far under a roof, a shoulder-length sling might provide enough extension to keep the rope running straight. clipping this way is acceptable. from the front and emerges on the rock side. accidentally unclip if you fall. At busy climbing areas, it’s often best to lower back to the ground through your own carabiners to save wear on the fixed rings. 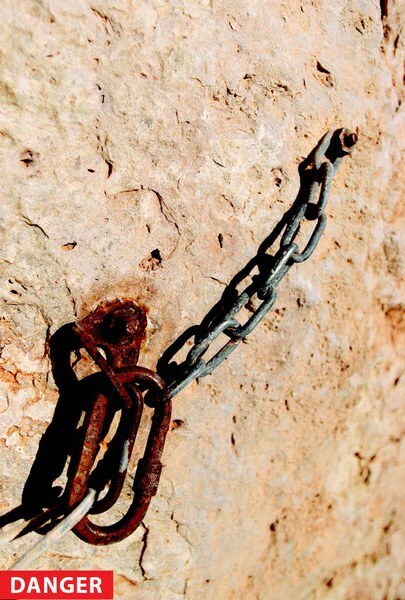 The last climber down, however, will usually lower from the fixed hardware.The rope should pass through steel rings or chain links attached to at least two bolts. Most bolt hangers are sharp on the inside, and they are not intended for passing the rope directly through. Large, thick, rounded Metolius rap hangers are the exception. Sometimes the last climber down rappels rather than lowering, to save wear on the fixed rings and the rope. Before the climber begins climbing, he and the belayer should discuss whether the climber is going to lower or rappel from the top. Do not lower with the rope running through webbing! the ground and top-roping off a bolted anchor. interfere with each other’s gates. 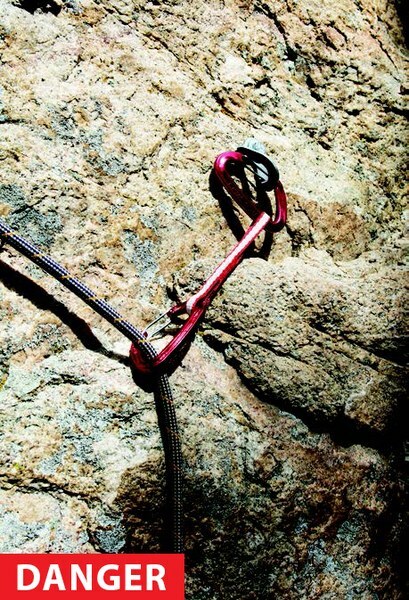 On multipitch sport routes, you often see climbers with bizarre rigging at the belays. Using a simple pre-equalized setup minimizes the gear required and increases the security of the rigging. If the positioning of the belay bolts is consistent from pitch to pitch, you can keep the sling tied and just clip it into each new set of anchors. When anchors are built from modern, half-inch stainless-steel bolts, equalizing the bolts is not necessary. On hanging belays, this is an advantage because the belayer can stay suspended below one bolt, taking advantage of a foot ledge or staying out of the leader’s way. A single power point in this scenario becomes awkward and inefficient. of the bolts as a first piece of protection. Carabiners are strongest when loaded along their spine with the gate closed. If the gate gets pushed open, the carabiner loses about half its strength. The UIAA certification for carabiners requires open-gate and cross-loaded strength of at least 7 kN (over 1,574 pounds) of force—plenty strong enough to hold the typical sport climbing fall. If the carabiner gets leveraged over an edge, however, it can break from as little as 2.5 kN (560 pounds) of force—even a small climber generates this much force in a typical climbing fall. Pay attention to avoid dangerous carabiner orientations. Beware of excessive wear on fixed quickdraws. 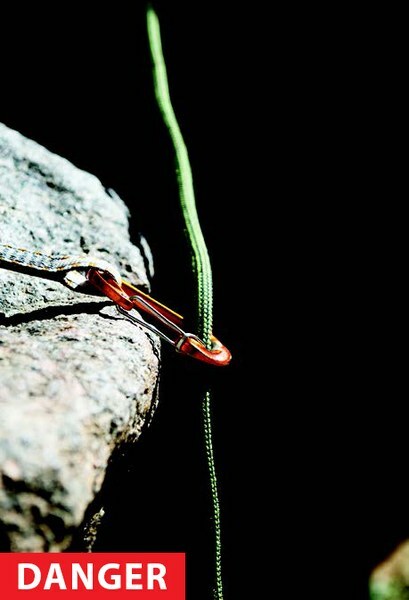 The rope-end carabiner can wear to a razor-sharp edge and cut a rope. sure that carabiners get loaded along their spines. With the exception of the header image, all photos by Topher Donahue and Craig Luebben. For more thoughtful instruction informed by decades of hard-earned knowledge, be sure to pick up a copy of Rock Climbing Anchors, 2nd Edition.